Before you delve into this Indonesian intrigue, you might want to explore Turkmenistan’s Gates of Hell. 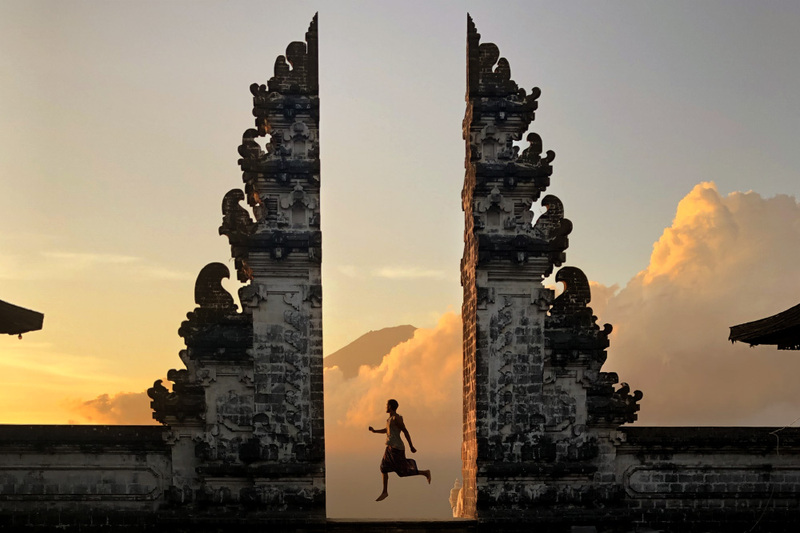 Perhaps we are all too familiar with the Instagram famous Balinese gate shown below. Poised in a regal and antediluvian form, it is picture perfect, an ideal photographic frame for any tourist exploring Bali. I had been to Bali not too long ago, and the Balinese gate was literally everywhere. Man-made ones, recently constructed to meet the visitor demands for a feed-worthy, enviable shot were aplenty. Of course, there were also the sacred, cherished ones, true ancient relics of the Balinese Hindu. Naturally, they weren’t just scruffily labelled as “Balinese gates”. 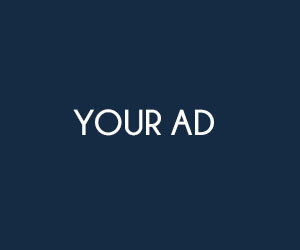 The more appropriate name: Candi bentar. Split in a perfectly symmetrical image, the candi bentar is traditionally found at entrances of many Javanese or Balinese temples, palaces, or other religious sites. The inner surfaces are typically bare and unornamented, creating an appearance of the rock being fissured into two. Believed to date back to the Singhasari and Majapahit Hindu period, the gates serve as a border, between the outer realm, and the nista mandala (outer sanctum) of the Hindu temple. Above: A tourist takes a scenic sunrise shot at the Gates of Heaven, courtesy of Tim Snell. Below: Three eyecatching Naga-lined stairways lead up to the first temple, courtesy of yeowatzup. Well, the unfortunate truth. 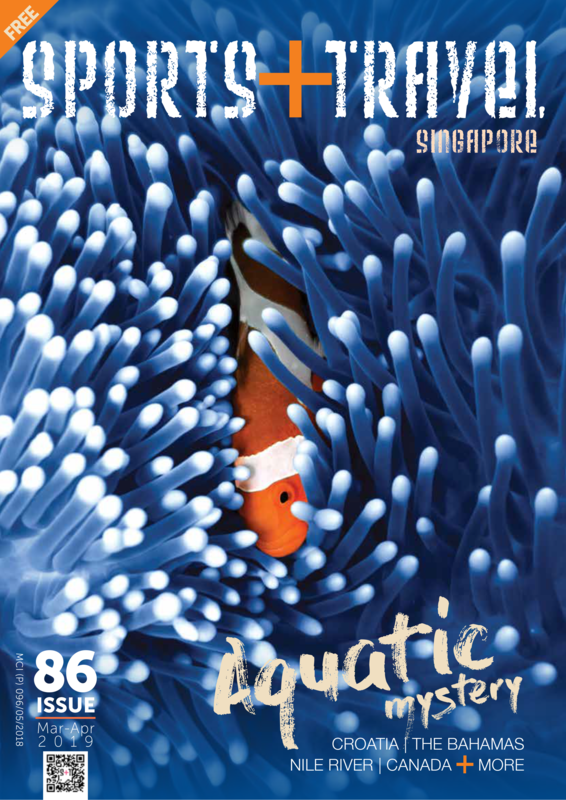 Not all candi bentar are created equal, at least in a purely artistic, aesthetic perspective. 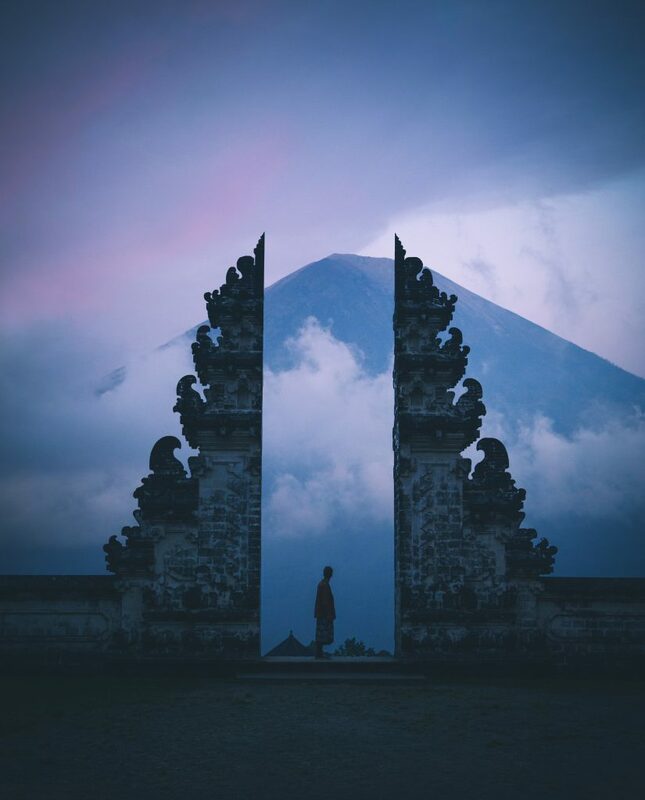 Among travel circles, the candi bentar labelled as the most beautiful in Bali is unceremoniously dubbed the Gates of Heaven. 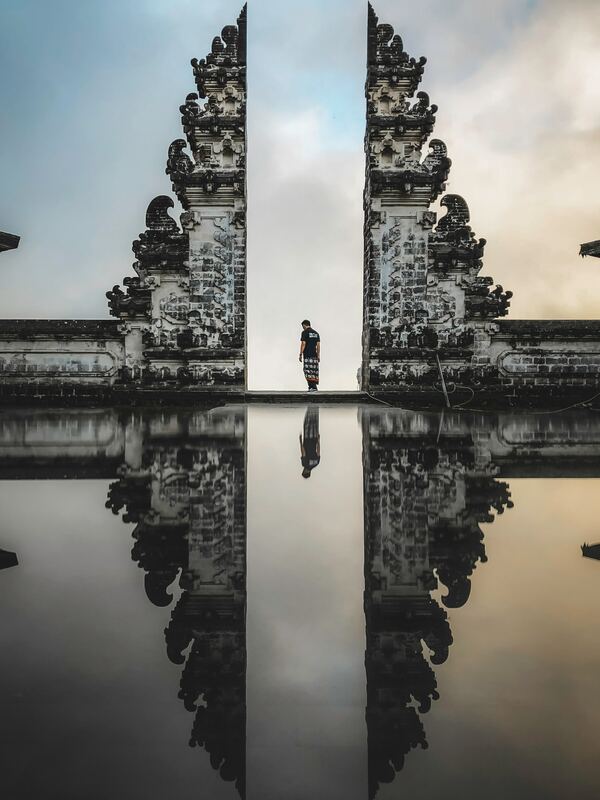 Remotely situated on the eastern side of Bali, about two hours away from Ubud, the gate is a structure part of the Pura Lempuyang Luhur complex, a series of seven temples, that dot the trail up Mount Lempuyang. 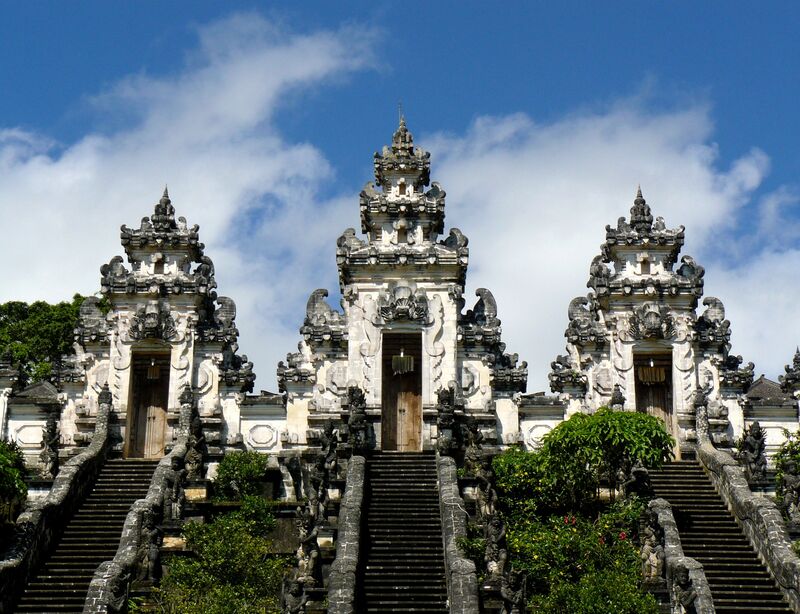 The entire site is hallowed, widely considered to be one of the holiest and oldest temples in all of Bali. The highest temple, Pura Lempuyang Luhur, sits atop the Mount Lempuyang, offering magnificently resplendent views of the surroundings, and is the area’s most sacred spot. One need not travel too far up to locate the candi bentar in question. The Gates of Heaven were built at the site of the first temple, warmly embracing (and impressing) the visitors and worshippers. And what makes this particular candi bentar the most thrilling and extraordinary? The sight of Mount Agung spectacularly rising in the background. Monumental and royal. The shot is incredible. – The site is quite far away from the usual tourist sites in Bali; to make your visit to the area even more worthwhile, do also consider paying the Tirta Gangga Water Gardens a visit. – Your shoulders and knees have to be covered, and you would have to wear a sarong to enter – no matter your gender. Sarong rental services are available, at the entrance. – The entire hike of the seven temples takes around four hours to complete. – Avoid complaining as you make your way up the Mount Lempuyang; locals believe by complaining, one would never make it up top.